America’s political system is a mess. You might think this is just the latest example of a liberal suddenly developing a problem with our political system because his party is no longer in power. I suppose that is reasonable, to some degree. Since Donald Trump’s election, there has been no shortage of outrage and hysteria about the direction of American politics; some of the outrage is well-founded, but I’ll concede that a fair portion of it is an overreaction to anything Trump does, just because he’s Donald Trump. The American political system was not broken when Trump won the Electoral College. The outcome of November’s election was not a breaking point; it was simply the next logical step on a path down which we’ve been heading for quite a while. The evolution (or regression) of our political system has been decades in the making. Once upon a time, American politics was about compromise and good faith; each party had its own set of principles and standards towards which its representatives worked. These representatives knew that the likelihood of achieving all their goals was slim, and as a result, they were willing to work with their colleagues across the aisle to craft legislation that would satisfy both sides. Somewhere along the way, that style of governance died a quiet death. Slowly but surely, the spirit of cooperation and civic duty was replaced by one of contention and vituperation. Our representatives no longer acted as the glue holding together the disparate elements of their bases; instead, they began to act solely in the interest of whatever portion of their base was largest. The 2010 midterms were a prime example of this phenomenon in action. The willingness of the Tea Party to primary any Republican whose ideas weren’t far enough to the right meant that no seat was safe; as a result, establishment Republican politicians were forced to pander to the more extreme elements of their base in order to maintain their seats. Not only that, but establishment Republicans were soon joined by Tea Party-backed representatives, many of whom had little — if any — experience in government and who did not recognize the need for collaboration with their Democratic colleagues in order to make any legislative progress. They were hard-liners, unmoved by centuries-old political norms and traditions and bound by nothing but their ideology. In the wake of the 2016 election, we’ve begun to see a similar shift on the left, as center-left Democratic candidates (including Hillary Clinton) are derided by leftists and the socialist wing of the party’s base. American politics is quickly becoming a battle of extremist ideologies, and there appears to be no end in sight to the coarsening of the political discourse. Some have begun to point to this rift as evidence that there must be a seismic shift in the way American politics are conducted. One of the most common refrains is that we need something to serve as a counterweight to the two existing parties whose ideologies are moving further apart and closer to extreme ends of the spectrum with every passing day. The proposed solution? A three-party system. Here’s why it won’t work. The most obvious problem is simple: Where exactly would this proposed third party sit on the ideological spectrum? Let’s use the Green Party as an example. The Green Party’s main platform planks are (in no particular order): environmentalism, nonviolence, social justice, gender equality, LGBT rights, an opposition to war and an opposition to racism. In other words, the Green Party’s platform is pretty much identical to that of the Democratic Party. What about the Reform Party? Their platform is inoffensive, if not particularly interesting; that said, they identify themselves as a “moderate, centrist and populist party,” so I can’t imagine any of their candidates getting anyone particularly excited about them. How about a Socialist Party? Considering one of the most common insults about President Obama was that he was a socialist, it’s unlikely that they’d capture many (or any) conservative votes. Not to mention, the implementation of true socialism would require nothing short of a complete overhaul of our government, to say nothing of our societal values. Democratic Socialism would likely be the closest we’ll come to that, but that brings us back to the thorny issue of the word “socialism,” plus it’s got “Democratic” in the title. How about the Libertarian Party? Well, their values are a bit more interesting; in short, they combine the Republican Party’s rejection of government interference with the Democratic Party’s embrace of individualism and an individual’s right to choose. However, they also promote laissez-faire capitalism and the abolition of the “welfare state,” both of which are too conservative to engender any full-throated support from the left. In other words, all of these options are either too liberal for conservatives, too conservative for liberals, or too centrist for both. who are not members of either political party. And though they may be Independents, Sanders still ran under the Democratic Party, and King votes and acts, for all intents and purposes, as a Democrat. There is no third-party representation at any meaningful level of government; as a result, there is no way for the average American voter to understand and weigh the merits of a third party. 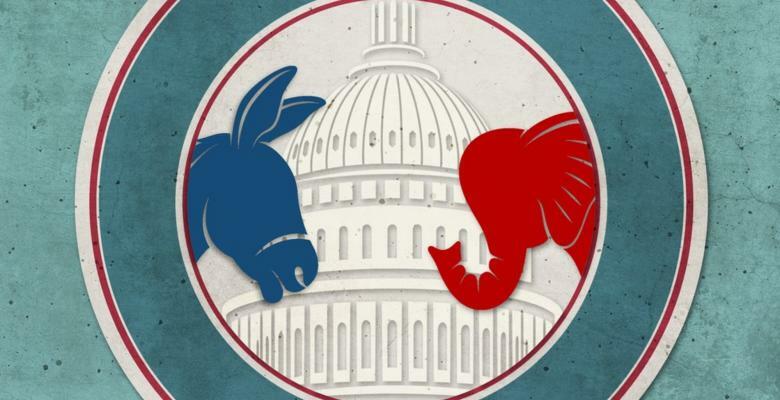 A two-party system has persisted in America for this long because until recently, those two parties largely covered the whole ideological spectrum. We are accustomed to thinking of politics in a binary fashion: either you’re a liberal or a conservative, Democrat or Republican. At best, third-party candidates are viewed as individuals who didn’t have enough of a shot at victory to make their way into the primaries for one of the two major parties; at worst, they’re viewed as crackpots. At this point, two things need to happen in order for a true three-party system to become a reality. First, the spirit of cooperation and compromise needs to be restored; as long as centrism is regarded as a mortal sin in American politics, there is simply no realistic ideological space a third party can occupy that isn’t too extreme for either liberals or conservatives. And second, in order for people to consider a third party as a realistic option, they have to see more from that party. Not just every four years, but in local and state elections; in short, if a third party wants to be taken seriously, it has to start taking the political process seriously. That’s how you build a base, that’s how you get name recognition, and that’s how you can get your message out to the ever-growing number of voters, both liberal and conservative, who don’t like the existing system and want to see change. If things keep going the way they have been, I suppose anything is possible. But I wouldn’t hold my breath.